Just as the sandpiper roamed happily on this property millions of years ago, we want our special site to be trod on by birds, animals, and humans for endless generations. With this desire, we cultivate our vineyard land in the gentlest way possible. Our vineyards are farmed based on the principles of sustainable agriculture: a system that is environmentally sound, economically viable, and socially responsible. Sustainable farming considers the best practices for safe human consumption of crop, safety of farm workers and local residents, and the health of the environment. Deficit irrigation techniques were originally developed for apple and stone fruit orchards. The idea is to withhold water from the plants to some extent in order to place the plants in a state of slight physiological stress. Applied to vines after the fruit has set, it is effective in reducing vegetative growth and berry size, each helping to increase the quality of the fruit for winemaking. Ideally, deficit irrigation is an important factor in producing high quality grapes, while at the same time conserving the earth’s valuable water supply. In our vineyards, deficit irrigation along with a highly targeted irrigation system helps us to manage our water resources. 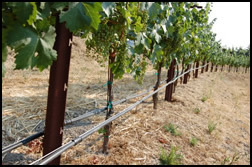 Our vineyard estate has a primary drip irrigation line which allows water to flow to every vine, and a secondary drip line which only allows water to reach weak or young vines. These lines are managed by a state-of-the-art wireless, computer-monitored irrigation system. It allows us to create multiple “micro-block” zones that let us better treat each of our vines according to its needs, instead of treating an entire vineyard area in one uniform way—thus reducing wasteful watering cycles. Pest management is an important part of any agricultural endeavor, and unfortunately, has historically been the most environmentally damaging process. We utilize an integrated pest management system which allows us to minimize our dependence on chemical controls. By using intimate knowledge of the vineyard as an ecosystem and the lifecycles of each pest, a viticulturist can target the pest’s most vulnerable life stage, can exploit beneficial, naturally occurring predators, and can minimize favorable pest habitat in order to keep pest populations at an economically manageable level. In this kind of pest management strategy, eradication of the pest is undesirable. Instead, the pest is maintained below a harmful level in order to keep the ecosystem balanced and functioning. Beneficial predators can be used to control pests of all shapes and sizes: from tiny spider mites that live on the grape leaves to gophers and moles which damage roots and trunks. We have planted an insectary--a patch of favorable habitat for predatory insects and spiders. Perches, houses, and nest boxes encourage vertebrate predators such as raptors and bats. This integrated system allows us to keep pest populations controlled. Subterranean barrel storage which maintains cool temperatures and stable humidity crucial for barrel aging of our wines without the excessive (and expensive) use of constant cooling systems. Investing in state of the art technology to reach our objectives efficiently and effectively. Minimal water use is integral in our standard sanitation procedures for cleaning all tanks, equipment and tools used in the cellar. Solar panels installed on the property utilize renewable energy and have helped us reduce our electric input needs. Frequent measuring of water, electricity, and refuse usage within the winery. This helps us target achievable reduction goals using real-time and accurate data points. 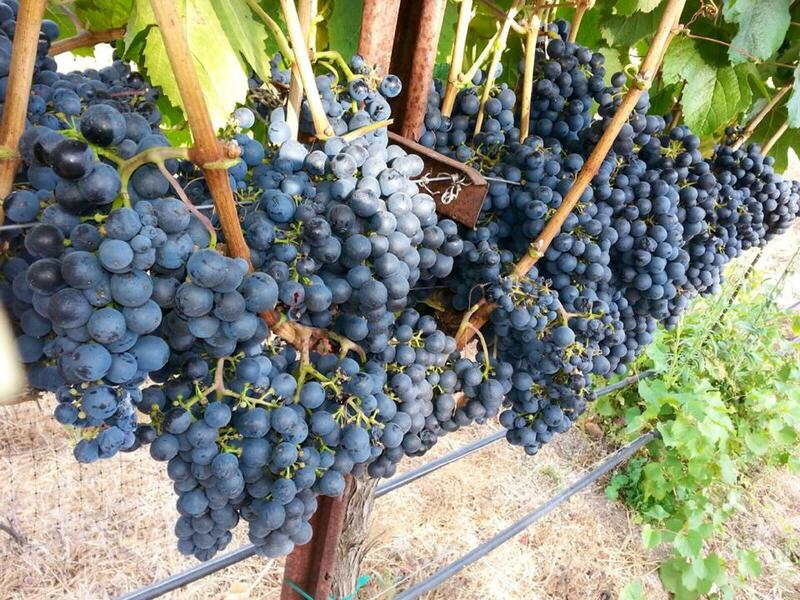 We are a Napa Green Certified Winery, one of the leading sustainability certifications for the wine industry.